February is going to be a VERY busy month! 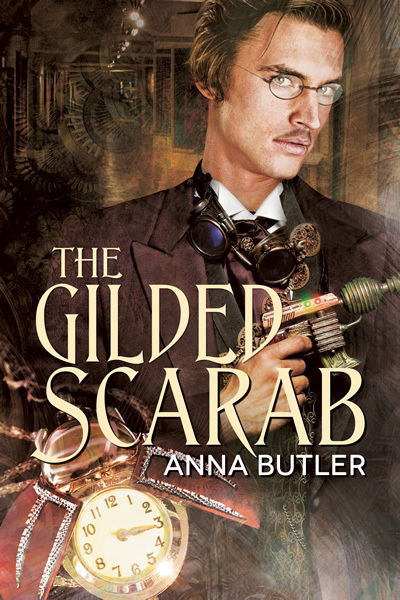 I am jumping up and down here in excitement, because The Gilded Scarab has appeared on Dreamspinner’s ‘coming soon’ page and that means it is *real*. It’s happening. The polished wood and dark red velvet of the lobby carried through into the Praecipias, giving the lounge a rich and luxurious feel. The light of crystal chandeliers glinted on cut glass and the bottles ranged on shelves behind the bar. As the maître d’ had hinted, it was still rather early and the company was thin. Two patrons sat at separate tables. They straightened and looked back at me when I glanced around, both wearing smiles and expectant expressions. But no. They were good enough, but neither appealed to me. The trick was to pretend I hadn’t noticed them at all, instead focusing on my scotch and lighting one of the thin cigarillos I’d bought at the tobacconist. That way no one’s feelings were hurt. A shame, perhaps… but no. Thanks to Phryne’s careful hands, I was shining that night. I deserved better than good enough. I deserved much better, and I could afford to wait until there was someone whose company I fancied. So I drew on my cigarillo and inhaled the sharp smoke. If I tilted my head back, I could watch the smoke float up toward the embossed ceiling. It hung in the light, drifting back and forth, and back and forth. I really am not a nervous man, but I jumped. Good Lord! Where had he come from? Sneaking up from the left, where I still had difficulty seeing things on the edge of sight, I supposed. I hadn’t seen him approach, and now that I looked, two or three others must have come into the room while I had contemplated my scotch and stared at the ceiling. Two stood at the bar talking, and a third slid into a chair at a table near mine, his dark eyes raking me over. He looked faintly familiar, although I couldn’t imagine where I’d seen him. He was well enough, too, but I turned my attention to the man who’d spoken to me. Oh, but this one was better than good enough! Much better. About my age, by the look of him, but as fair as I’m dark—wheat blond hair in artful disorder, with quite astonishing hazel eyes set above high, pronounced cheekbones and a strong mouth and chin. Thank God he had a chin. There were far too many men who had none worthy of the name. The rest of the stranger was rather attractive too. He leaned on a cane in his right hand, inclining his long, trim body toward me. It gave him a slight air of eagerness that was, I felt, distinctly flattering, as well as allowing him to show off an evening suit that fitted him like the proverbial glove and must have cost a very pretty penny. Definitely better than just good enough. Unless he turned out to have all the personality faults of Attila the Hun, this one would most certainly merit further attention. And, really, Attila the Hun hadn’t been all bad. He was rumored to have been very considerate of his horses. Everyone is going to fall in love with Rafe. 🙂 Hell, I love Rafe, and I know he’s taken! Considerate of his horses. LOL! Beautifully written as always, Anna. You pulled me right in. And the cover is lovely. I’m glad you liked it. Rafe has a very distinctive voice and he was an absolute joy to write. I adore the cover – Reese Dante is so talented.